Show me someone who can turn their nose up at the nature in Vancouver, and I'll show you someone impossible to please. In reality, Vancouver is one of the world's most underrated cities when it comes to the marvellous outdoor spectacles of lush forests, canyons and wildlife. Visitors need only pull back the curtain. A rainforest on the coast, Stanley Park is nature cut from a different cloth. About 400 hectares of natural forest include walking trails, native animals, eateries, historical landmarks and more unforgettable adventures. Prefer dry land? Stroll along the Seawall, knock off 18 holes at the Pitch & Putt, and enjoy a picnic in the designated areas. Those who don't mind getting wet can use the heated outdoor pool, or find a spot on the sand at one of two beaches. Staying at the 5-star Sutton Place Hotel positions you close to the park along with its aquarium (Canada's largest) and various fine-dining establishments. While exploring, keep an eye out for some iconic British Colombia wildlife such as squirrels, bald eagles, foxes and various birds. Vancouver's Capilano Suspension Bridge is a dramatic example of mankind's innovation complementing Mother Nature. The first bridge was constructed in 1889 (don't worry, it's been rebuilt) and the current suspension bridge extends 140 metres across the Capilano River, putting walkers about 70 metres above ground level. Visitors are well and truly amongst the treetops as they get a unique view of the forest nature below. The Cliffwalk, a recent addition, takes a slightly different path and extends along a granite precipice of the river with a labyrinth of narrow bridges, stairs and platforms. There's also the Treetops Adventure, which includes seven bridges and multiple viewing platforms. Rooms at the luxurious Fairmont Waterfront are a great base from which to see the Calipano Suspension Bridge and the rest of Vancouver's city sights. Visit during the Christmas season for the breathtaking Canyon Lights show. Vancouver's local mountain is a year-round amusement park, dining highlight and natural gem. Grouse stays open during the summer, making up for no snow with a hit list of outdoor activities. 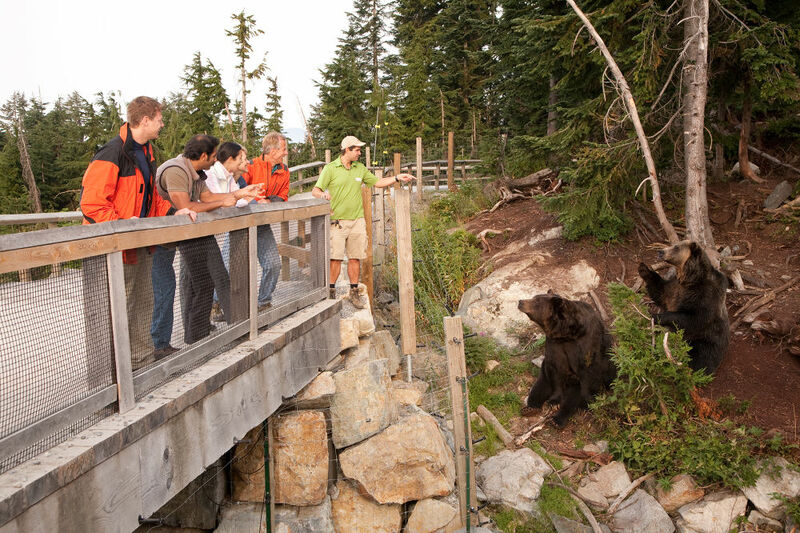 Visit the Grouse Mountain Refuge for Endangered Wildlife to see wild grizzly bears, owls, hummingbirds and a grey wolf. If you're an active traveller, there are numerous walking trails including local favourite, Grouse Grind, a 2.9-kilometre trail up the face of the mountain affectionately called 'Mother Nature's Stairmaster'. For a bit more adrenalin, try the mountain ziplines, paragliding or even a helicopter tour around the peak. There's plenty of action during winter too with ice skating, skiing and snowboarding, ziplining, and terrain parks with all the jumps and jibs you'll need to get trick-happy. Rain, shine or snow, the Peak Chalet always welcomes visitors with alpine shopping, the popular Theatre in the Sky and four dining options. Save one meal for The Observatory, which offers views to the city across the treetops.